One last post in 2014 ya'll! 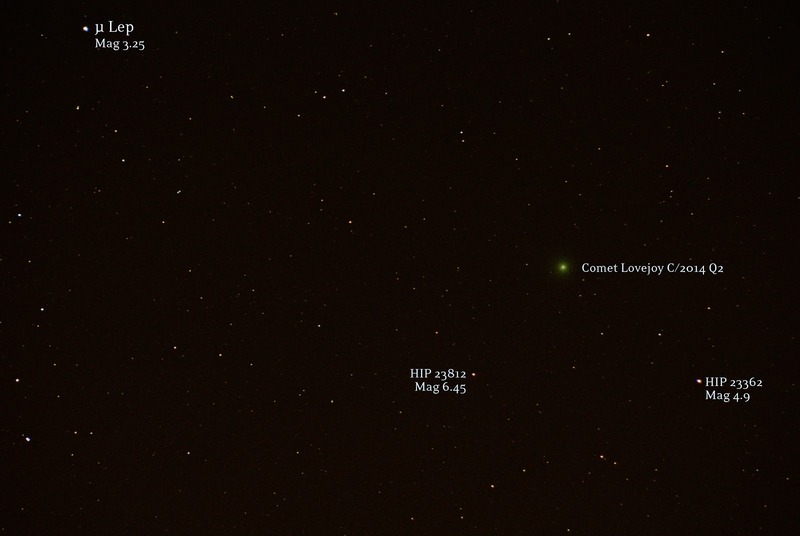 Here is Comet Lovejoy C/2014 Q2 at 10pm ET tonight, taken with my DSLR on a fixed tripod and stacked in Deep Sky Stacker. In spite of the bright moon, the skies were completely clear and the green color showed up without cheating the saturation up at all! In Photoshop, I stretched the histogram in levels by sliding the gray slider to the left, then used the eye dropper in Curves to identify the grays and turn them up. Next, I created a Gaussian blur layer and subtracted it to get rid of the slightly red hot zone that I had from not taking flat frames. 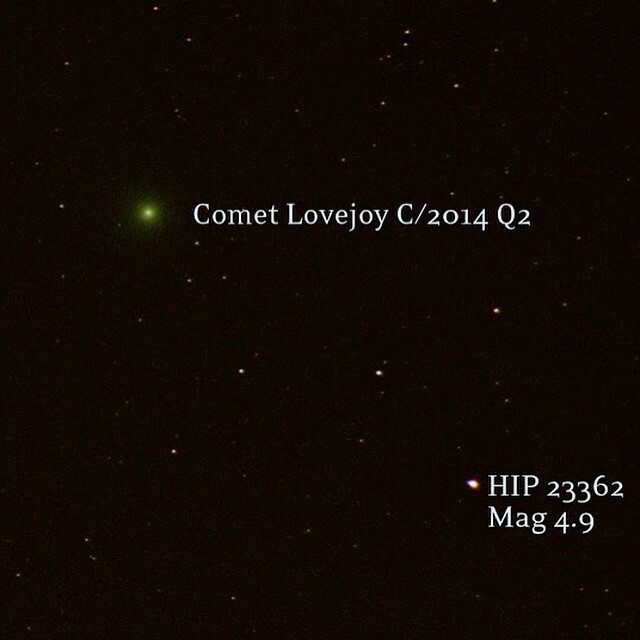 Comet Lovejoy C/2014 Q2 is currently in the constellation Lepus, and the celestial rabbit's bunny ears made excellent pointer stars to help locate the comet last night! 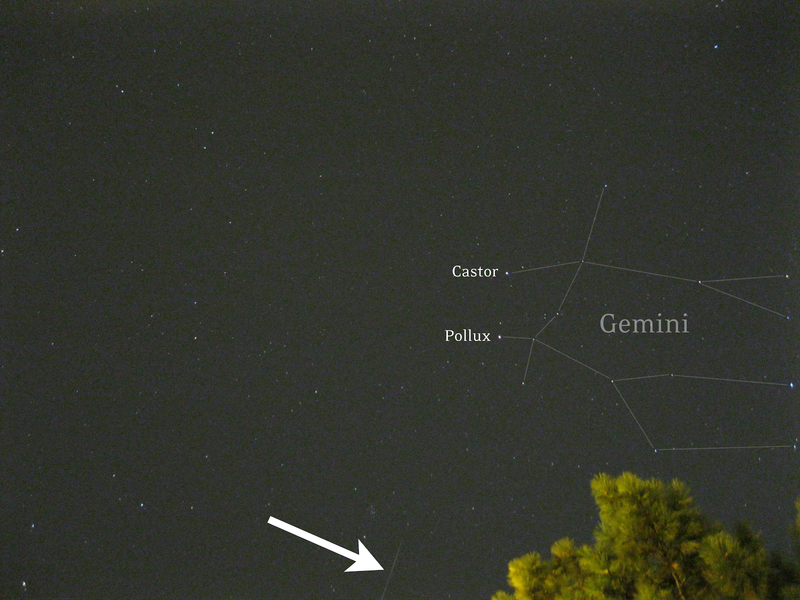 The comet was visible with binoculars and with my DSLR even through thin clouds. Tonight is supposed to be crystal clear, so I might make another attempt to photograph it since I don't really have any NYE plans. Although it's been the third least snowiest December on record in central Indiana, I think I could count the number of clear nights on one hand. When the skies aren't cooperating, I get a little stir crazy - so I had to battle my friend Luke in the backyard using my epic lightning powers! FOCUS: To focus the image, have the subject stand in the spot where they will be during the photo and shine the light on themselves - try lighting up the face and clothes, just enough to give the photographer a target. Lock the focus on the subject when they are bright enough to autofocus. 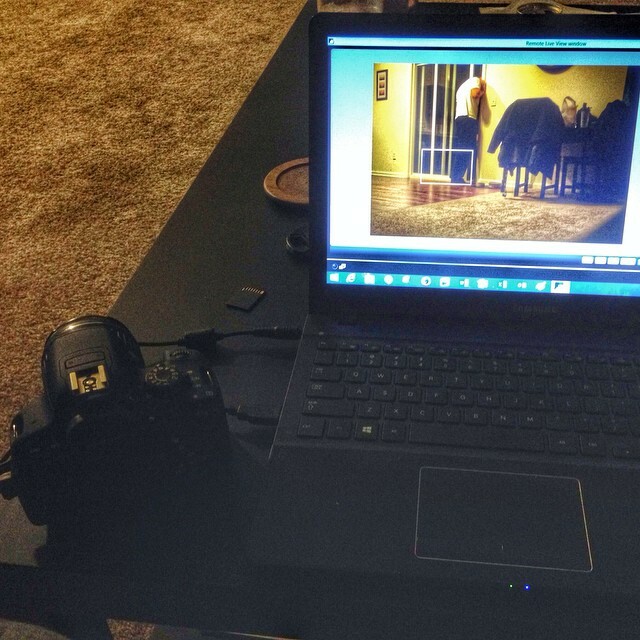 LIGHT THE SUBJECT: Now start the photo with a 3 second delay and run over to the subject. First establish them in the image by shining the light away from the camera toward the subject - simulating a flash essentially. Paint their body with light for a few seconds. DRAW WITH LIGHT: Now with the flashlight aiming toward the camera, paint the lines you want to show up. We used a simple white LED keychain for these. I realized when I upgraded my iPhone, I also made my Glif mount for the iPhone 5 less useful - seen here with my new iPhone 6 (in a case) rubber banded to it to hold it in place... Apparently they make a new Glif iPhone tripod adapter mount that is more universal and accommodates the curved edges of the new iPhone 6. I also tried light painting with my Canon T5i. I made the image below by stacking several frames in Photoshop and using blend mode Lighten to only incorporate the lightest parts from each image. 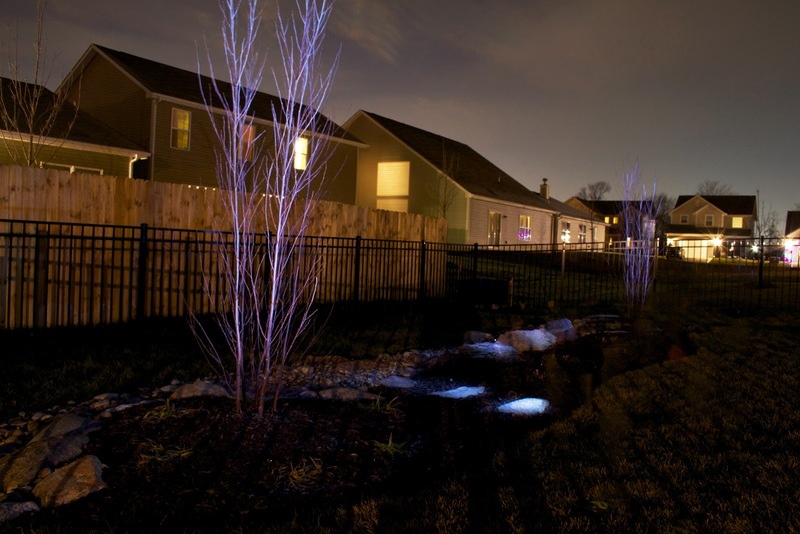 I painted the birch trees and step stones with a white LED. I think it looks a little like lightning! I really like the blue glowing energy in this image! My sister got me these cool eclipse viewing shades for Xmas! They look like normal sunglasses, which is a lot cooler than those paper eclipse shades they hand out at viewing parties, and a lot more functional that just getting a sheet of black polymer. They are comfortable and feel very sturdy. They look like bug-eye regular sunglasses, but once I put them on I immediately realized these were no normal sunglasses. I couldn't see a thing! It's clear that these No. 14 Welder's Glass green shades filter much more light than the typical pair of sunglasses. Check it out, when I hold them up to the light, you can't even see through them! The glasses also come with these protective side shades. The material looks similar to what the frames are made from, but not the same thing as the lenses of the glasses. I wanted to check them out, so I held them up to the bathroom light too and could see through it. These definitely don't filter as much light - so never use the side shade thing to look at the sun! I think the reason they give you these side extension is to help block light coming in from the sides. When you look at the sun, because the black glass is reflective you can end up being distracted by the reflection of your own eye looking back at you. These side shades help a little bit, but I ended up taking them off and just using my hands to block light on the sides. I guess the other reason is because these are literally welder's safety glasses, so the side shades probably help protect your eyes from sparks. This is my first time looking at the sun through welder's glass, which makes the sun appear an eerie green! It's still pretty bright, I'm not sure if you'd be able to see any sun spots with welder's glass - but it sure does give you a nice view of the sun's disk, which is what really matters during an eclipse. We've had so many gray cloudy days and nights this season so far! It's driven me outside to try to photograph anything resembling stars, in this case Christmas lights! Ok, the first thing I learned right off the bat is that Christmas lights are not stars, and do not use the same settings as stars. But I sort of have a reputation for being able to take photos at night, so it was definitely worth while to play around with some camera settings for Christmas lights to keep up that night-time photographer street cred. 1. Use a high f-stop number (narrow aperture) to get pretty lens flares around the lights. This also works with bright stars and planets! Usually when I shoot stars I shoot with a wide aperture to let in the most light (low f-number), but this is not the ideal setting for Christmas lights. 2. 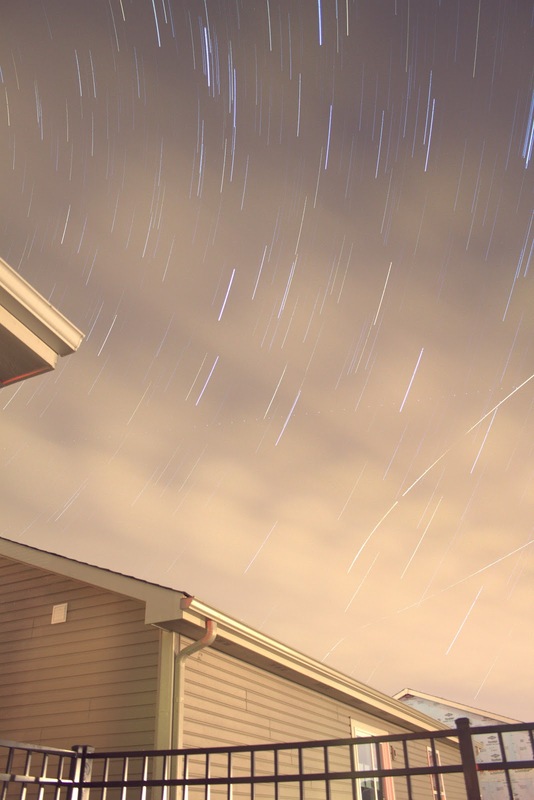 You don't have to worry about star trails, so you can use a looooong exposure. I tend to use a wide open aperture for stars to maximize the amount of light I let in as quickly as possible before the stars move, but with Xmas lights this isn't an issue. Keep it narrow and long! 3. 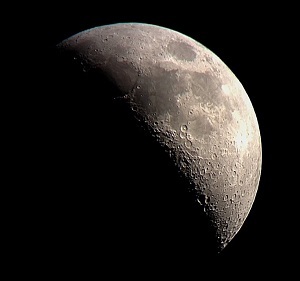 Low ISO to reduce background noise. 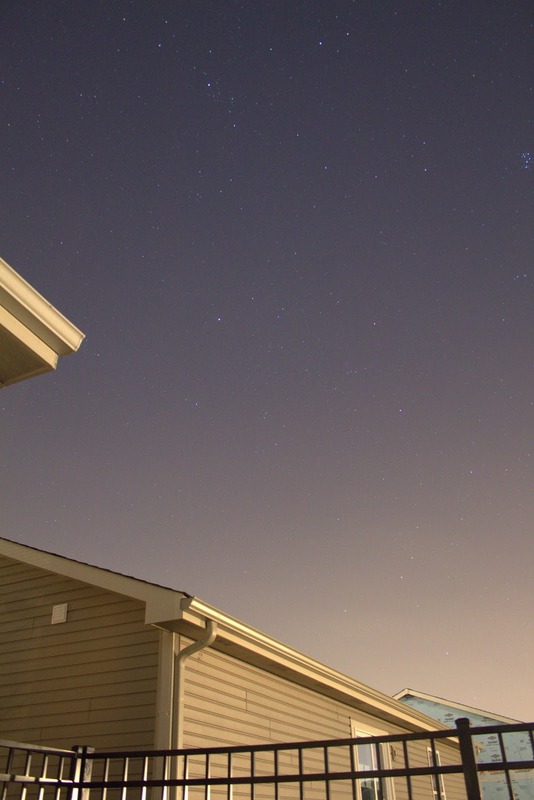 You have all the time in the world, the house isn't moving, so use super low ISO and longer exposures. Let the individual lights show, or you'll end up with a big bright blob in the bushes. 4. 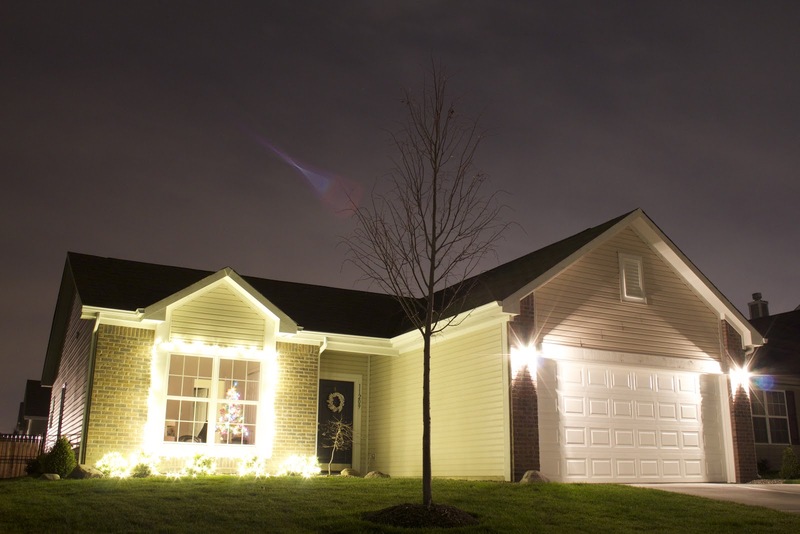 Turn off indoor/window lights and porch lights, let the ambient light show the house. 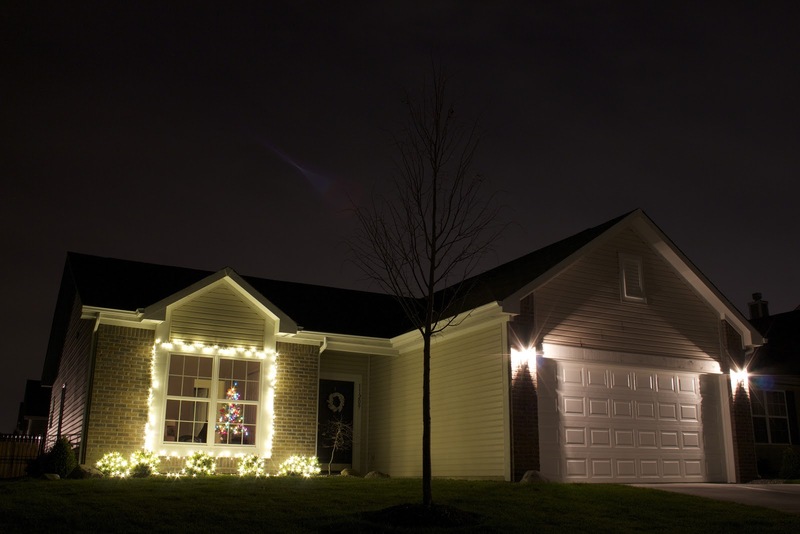 If you are doing a whole house shot, porch lights might drown out the Christmas lights. I prefer to let the glow from the lights reveal the house. 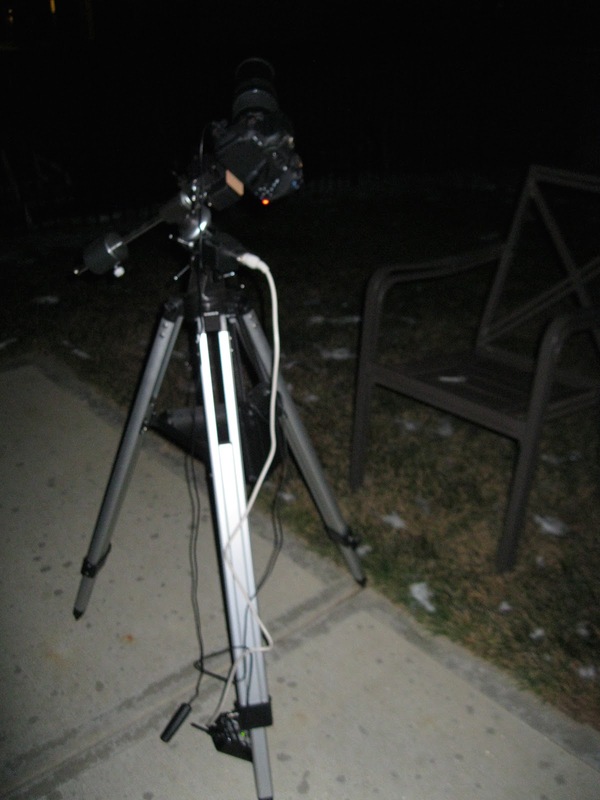 After two successful Geminid captures (particularly last year) I guess the weather wasn't in my favor this year. 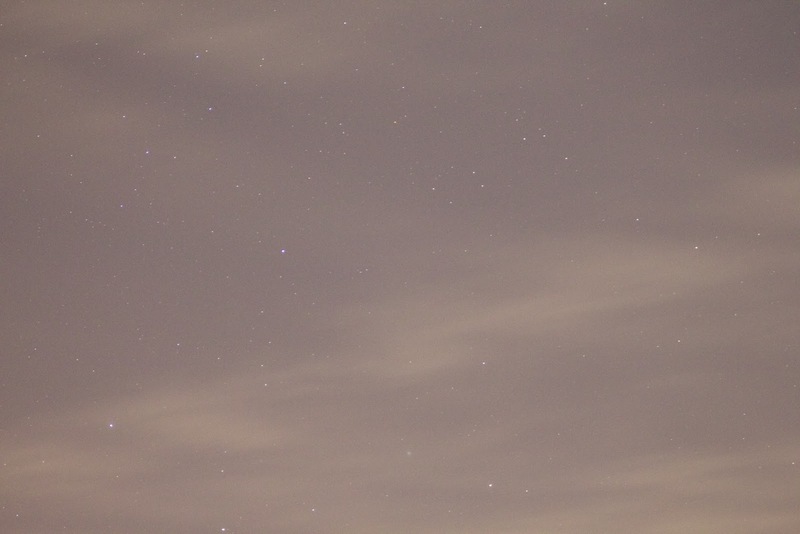 I made an attempt at photographing the Geminids meteor shower on December 11, 2014 at 9:11pm. It was a completely clear evening and sunset, and started with a clear sky - but I think the warm air during the day led to a blanket of clouds after sunset even though the forecast actually looked very promising! Photos above adjusted in the app Snapseed using the 'Automatic' filter, it does some quick work! I made the images into a timelapse video: 152 individual frames taken with Canon T5i, each at f/4, 18mm, ISO 800, 15 sec; Timelapse in Sony Vegas with 0.07s still image duration each. After a short delay, the first test flight of the Orion multi-purpose crew vehicle successfully launched at 7:05am ET this morning! Woohoo! The impressive Delta IV Heavy rocket looks oddly flat and intimidating because the engines are all arranged in a row and not in a triangle - it's like a wall or row of silos 236 ft tall shooting up into the sky. 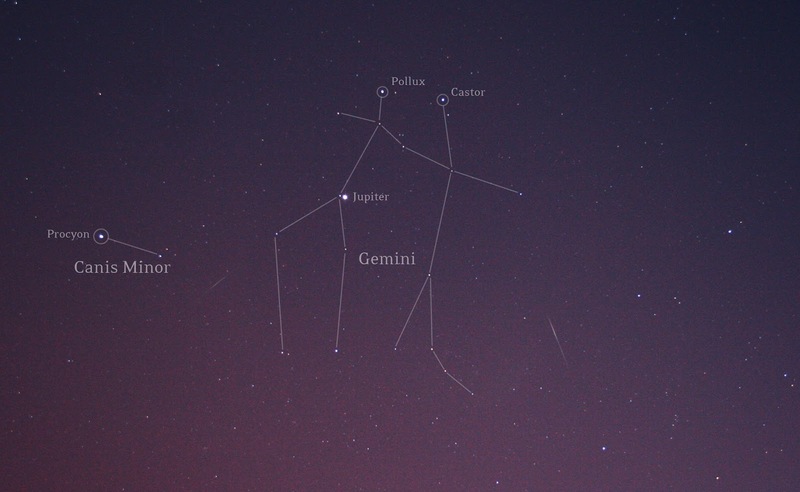 For the upcoming Geminid meteor shower, I'm planning to put out as many cameras as I can to increase my chances of catching a handful of big bright meteors! This includes my iPhone with the updated version of NightCap Pro, which has been shown to be capable of catching meteors with nothing but your phone! 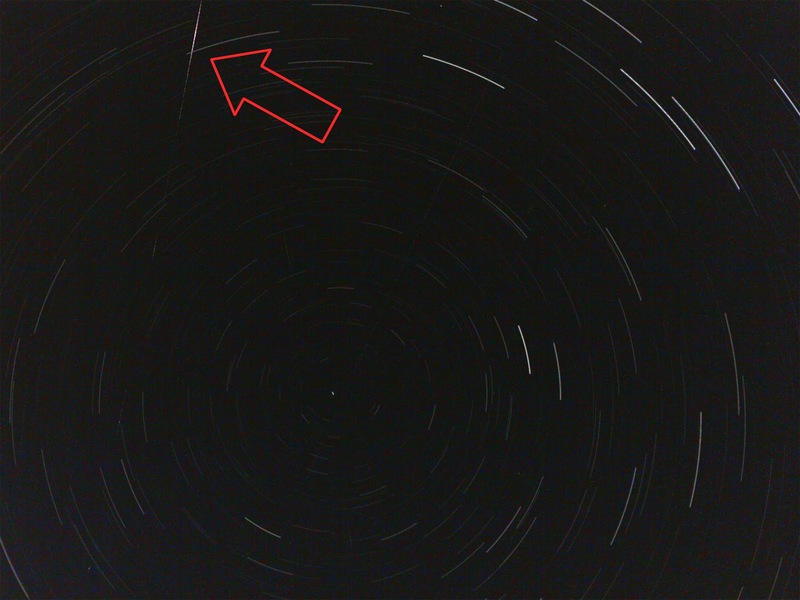 Using NightCap for meteors photos with your iPhone, select Night Mode , and Long Exposure (aka Star Trail) to create a long exposure photo waiting to capture meteors that fly by. I'm going to attach my iPhone to a tripod using the Glif tripod mount. I'm still using the iPhone 5 until I upgrade in January, so I have the iPhone 5 version, but I see they have a new universal adapter for just about any phone. If you want to go super cheap, you can also make a tripod adapter out of a binder clip - but this will wobble in the wind so it's not really the best solution. 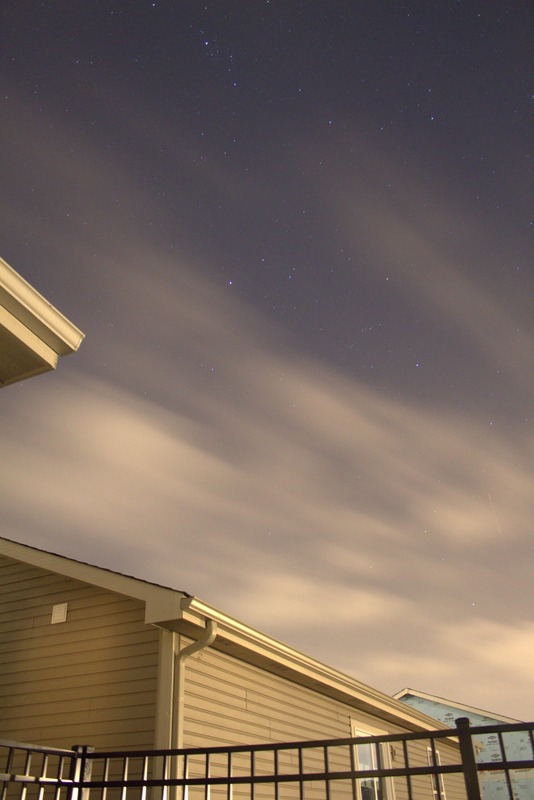 A big concern is battery life while taking a long exposure photo in the cold. You're going to want to plug your phone in to keep it charged. The combination of camera apps and freezing air really drains it fast. If you absolutely don't have access to a power source, you can try something I learned a while ago which is to give your iPhone a little winter coat made out of a plastic bag - it helps keep your phone protected from the freezing wind for a little while but it's not the ideal solution. Get everything set up and then leave it alone. As long as you have it plugged in, the phone shouldn't die in the cold and you should end up with a nice star trail photo dotted with meteors. I did most of my curves in DSS, even though I hear doing curves in Photoshop is a lot better. I just can't get it, but I keep trying. I used Photoshop for a bit of contrast and saturation. I was so pleased with the original color that remained even after stacking in DSS. It feels amazing to look back on my improvement over the years - I remember being excited about each of these images at one point and now they seem so basic! I have a lot to learn in processing, but I did make some major progress using flats at my EQ mount for the first time on Orion. Yes that's right! Flat frames! 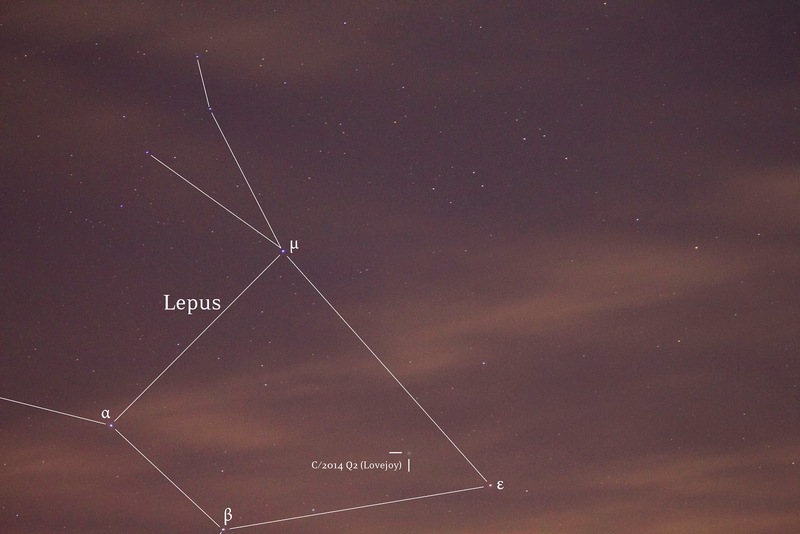 I found this article by BudgetAstro to be the most helpful, because I didn't realize the goal of flat frames is to get the histogram in the middle - unlike dark frames where you just slap the lens cap on and use the exact same settings. I tried using flats before but just used the same settings like dark frames and massively over-exposed my flats, which is pretty pointless because then no gradient or vignette remains. Me taking flat frames in my family room, trying to get the histogram just barely to the left of center. Adjusted exposure time and kept f-number, focus, and ISO the same as my light frames. I had massive hot spots in the center of my deep sky images last time, and with the flats this time I didn't have that issue with vignettes. Not saying I had a perfectly gradient-free field, but it was way better than a right gray hot spot. 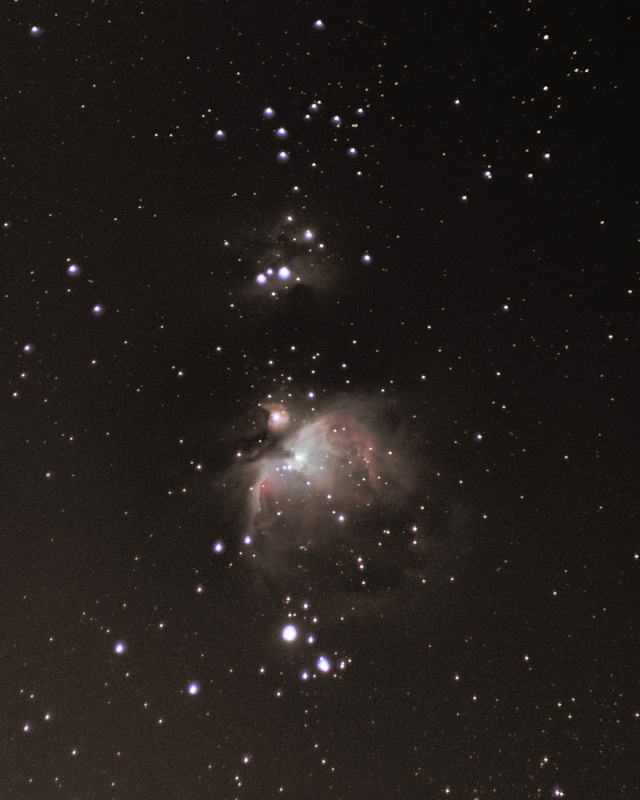 More gray November skies in the forecast, maybe I'll get some more time to practice my Photoshop curves - but either way I'm extremely proud of my big leap forward in M42! 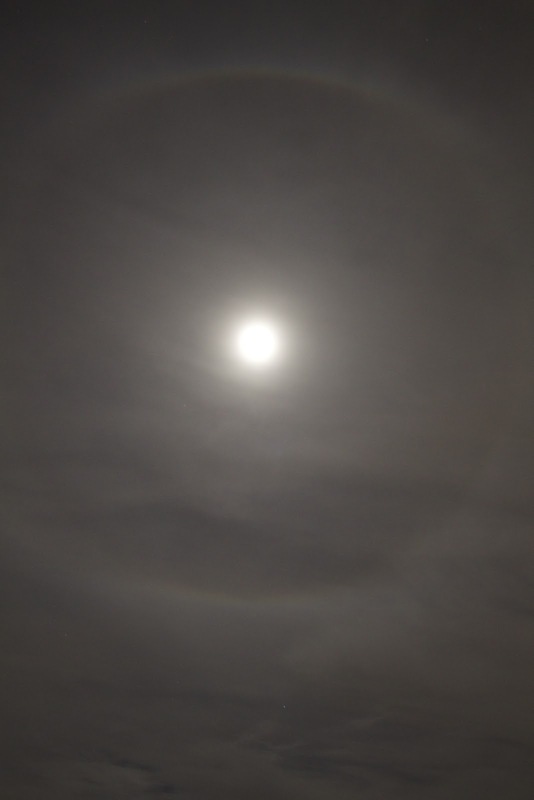 Tonight there was a ring around the moon, a rainbow lunar halo (a 22º halo to be exact). As light passes through hexagonal ice prisms in the upper atmosphere, no light leaves the prisms at an angle less than 22° making a distinct light/dark boundary with a radius of 22° radiating out from the moon. I believe this is my third time photographing a lunar halo - my first time was most impressive visually but faded when I went back inside to get my camera. My second time was a bit better last November in Brownsburg. 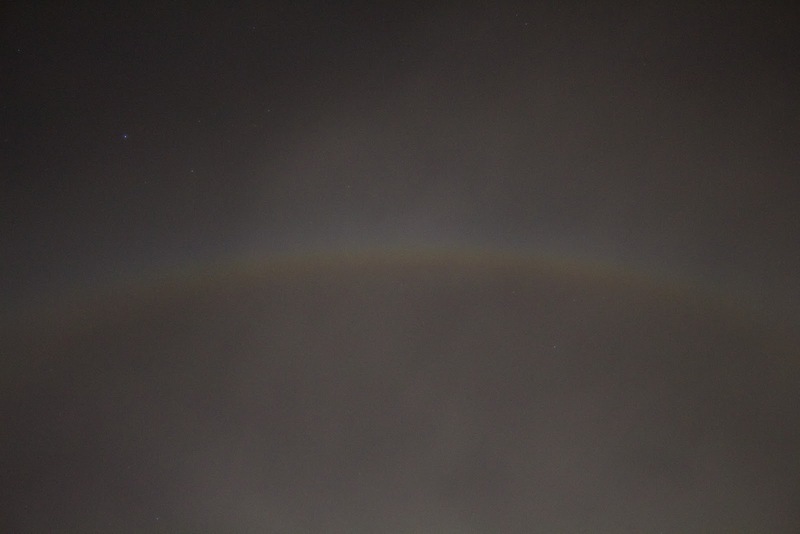 This time my lunar halo wasn't broken up by a contrail, and was clear enough to see the rainbow (or 'moonbow') effect of the light splitting into different wavelengths. These lunar halos can happen throughout the year, because the upper atmosphere can be cold enough for ice crystals even when the temperature below is much warmer - but I've only ever seen it in the colder months. 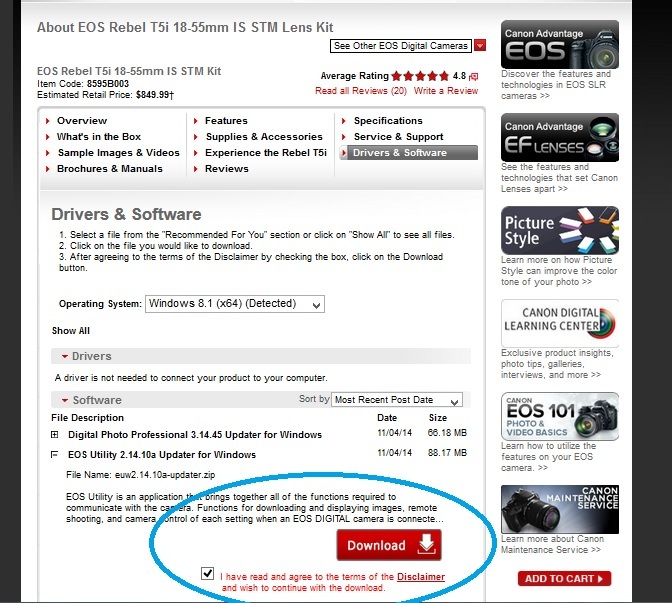 I want to use Canon EOS Utility with my Canon T5i, but my laptop doesn't have a CD drive - so even though I have the CD to install EOS Utility in hand, I can't get it onto my computer! 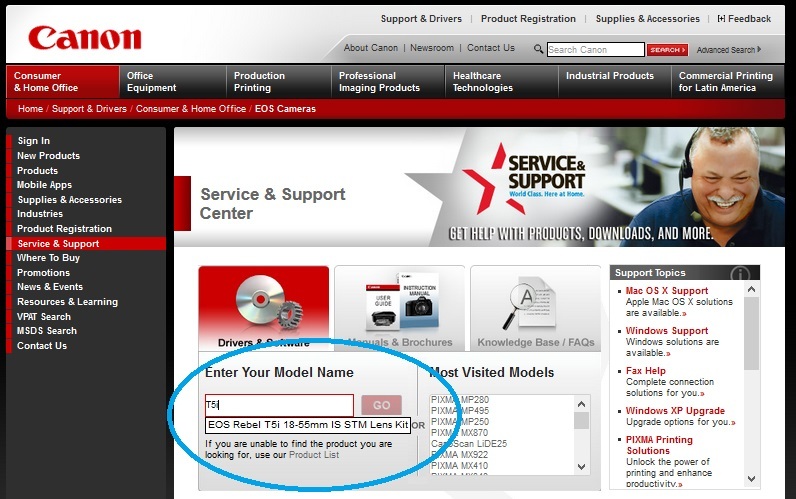 I went to the Canon website to try to download the software, but they only have an updater and not the actual application. What the heck! Luckily there is a work-around that I found online. 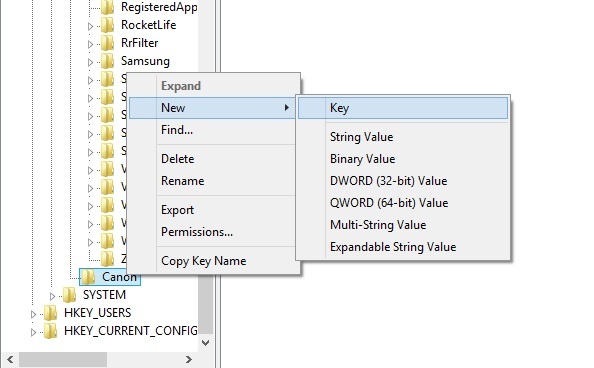 This video was super helpful (there's also one for OSX), but I can't stand tutorial videos because they always take forever and I just want to see some quick screenshots to guide me through the process. I guess it's just a personal preference. In any case, here are the steps - worked like a charm! And launch the updater program... What do you think will happen? 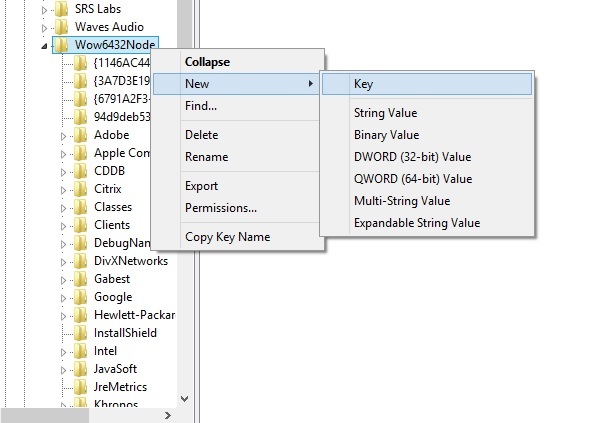 Name the new key 'Canon' and then create a new Key within this new Canon folder you just made... Name this Key 'EOS Utility' and type carefully. Success! 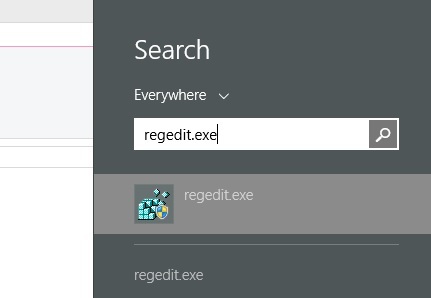 It's the install window and you didn't even need the CD!